5 days left to double your donation! Five days, $10,000 to go! Generous support is allowing us to give you an opportunity to double the impact of your tax-deductible donations to the Right to Life of Michigan Educational Fund for the rest of 2017. Our goal is $50,000, and we're still $10,000 short with less than a week to go. Without your support, our work would go undone. This blog would be empty. So would our website and social media accounts. Our TV ads would be seen by no one. Nobody would be here to research the information you rely on to be informed and engaged in our work to save lives. There are many ways the Educational Fund reaches people, but all of them rely on generous gifts from prolife people. Will you help us cross the finish line? Please donate now. Deceptive informed consent documents. Crudely chopped-up body parts. Excuses about "fees" when confronted about organ and tissue trafficking. Detailed prices per body part. Federal and state regulators out to lunch. These are the features of the stories involving Planned Parenthood's practice of selling human body parts following abortions in their clinics. These are also the same features of a series of stories involving "body brokers," who run filthy chop shops where corpses are bought and sold by part like a butcher's shop. One man in Michigan, Arthur Rathburn, is the nexus for these two stories. Reuters released an exclusive report yesterday that federal investigators found the bodies of four unborn babies in Rathburn's chop shop. The discovery is notable for two important reasons. First, selling body parts from corpses is legal, but selling fetal tissue is against federal law. Second, as Reuters reports, the unborn babies are not mentioned in the indictment of Rathburn or other public documents. Another familiar parallel that may be present in this case is investigators failing to take laws against fetal tissue trafficking seriously. Since October Reuters has been running a series detailing the macabre body broker industry that operates almost entirely beyond regulation and public scrutiny. Usually cases involving the unborn require some unrelated hook to get proper scrutiny, for example, Kermit Gosnell was initially caught because of his massive drug trafficking. In this case, Reuters' body broker series was flying under the radar of the public consciousness until Reuters found evidence of the dead babies, linking the practices of body brokers to the abortion industry. Reuters so far has done seven stories in their series. Those who closely followed David Daleiden and the Center for Medical Progress' investigation will see nearly perfect parallels in the details, as will prolifers used to dealing with the abortion industry. On the surface people are told these "services" are a benefit to them and society overall by advancing science. In reality, however, the body broker industry appears to show the same familiar disregard for the value of human life and the same willingness to violate moral norms to line pockets with blood money. Several examples from the seven-part series stand out. In exchange for paying for cremation services, poor loved ones would donate bodies to science, and in return be given back some ashes. One body broker found a use for every body part of a deceased man, and sent grieving family members back sand masquerading as the man's ashes. Reuters easily purchased the severed head and spine of a young man by posing as a tissue buyer. After purchasing the decapitated head, Reuters was able to locate the young man's parents to inform him of his grisly fate. The body broker failed to tell the young man's parents that this was going to be his fate in death. Medical conferences held in major hotels—even a Disney resort—have used their event ballrooms for cadaver labs. Body brokers sell the corpses, which are wheeled into the ballrooms on gurneys. Cheap plastic is thrown down on the carpet so the next day's wedding crowd (hopefully) won't discover bone fragments and bodily fluids as they dine and let their small children crawl on the carpet. Apparently abortion clinics aren't the only places where proper sanitation is an afterthought. What does this story mean for the prolife movement? It could mean a lot. Planned Parenthood did everything they could to distract from the undercover videos that revealed their practices to the outside world. They've been able to trick many of their supporters into believing the practice of fetal tissue trafficking is "fake news." With this news coming on the heels of revelations of a federal investigation into Planned Parenthood and convictions in a related case, the baby body parts story may have just begun. The story may result in a public examination into wider practices involving tissue trafficking. Laws may be changed. Organ donations and tissue donations are not just an issue that impacts unborn children, but also plays an important role in end-of-life situations. Simmering in the background is the idea that euthanasia can be successfully combined with tissue donation. Will patients find themselves pressured into accepted death, only for their bodies to be horse traded like cuts of beef at the market? In the particular case of Michigan's own body broker, Arthur Rathburn, it's unclear if the four bodies discovered were children who had been aborted or stillborn. From the pictures Reuters released, at least one baby was either not aborted using the dismemberment abortion procedure (D&E), or the baby may have been born before the abortionist had a chance to tear apart his or her body. The babies may have come from Michigan, or anywhere; one part of Reuters story involves Rathburn driving back from Canada with 10 severed heads in his vehicle. These questions demand answers, but from Reuters' reporting, it appears investigators may once again be derelict in their duty. If nothing else, at least these revelations have served to bring public scrutiny to these awful cases. Rathburn's trial in federal court in Detroit is scheduled to begin on January 4. He is facing charges of fraud and lying to investigators. We'll hopefully have more details for you after that date. Is there no end to the depth of human depravity? Abortions are steadily decreasing in America every year, and so are abortion facilities. In the U.S. 49 abortion clinics closed in 2017. Counting new facilities opening, the overall numbers of abortion facilities decreased by 27 in 2017. When you add it all up, 77% of all abortion facilities that were open in 1991 have shut down. Even with abortion clinics closing right and left, Planned Parenthood’s market share of the abortion industry is up. In 2017 there were 704 total abortion facilities in the U.S. and 347 of those were operated by Planned Parenthood. Planned Parenthood itself has seen a small decline in their abortion facility count. In 2016 they were operating 354 abortion facilities in the U.S. Planned Parenthood tries to sell abortion as a trivial part of their organization, yet they run half of the nation's abortion facilities and provide about a third of the nation's abortions. Planned Parenthood is Abortion, Inc. There are less than two weeks left in 2017, and we are 60 percent of the way to our goal of $50,000 in year-end online gifts. These tax-deductible gifts to the Right to Life of Michigan Educational Fund are being matched thanks to generous support. Where are these gifts spent? The Ed Fund is dedicated to educating people and motivating them to action. There's many ways to do that, from big-budget TV advertising and documentaries to reaching people on social media or through a flyer at a county fair. All of these activities share two things in common: they are life-affirming, and they are only possible because of generous gifts. Will you help us take full advantage of this opportunity to double support for human life? This is the seventh and final entry in our monthly series looking back at historically significant profile moments in our state’s history. The question of where you go when you die is ages old. In the 1990s, euthanasia and doctor-prescribed suicide advocates thought they had come up with the answer: Michigan. That was the basic premise of a TV ad featuring the white Michigan-shaped headstone you see in the picture above, with Michigan Lt. Governor Connie Binsfeld standing behind the podium. The drive to legalize doctor-prescribed suicide in America saw its first legislative victory in Oregon in 1994. The debate over the issue, however, was centered in Michigan, with Jack Kevorkian acting as the most visible face of the movement. On June 4, 1990, Kevorkian helped 54-year-old Janet Adkins commit suicide in a van by lethal injection, thus beginning a clash of epic proportions. Who was Jack Kevorkian? Hollywood may sing his praises by casting Al Pacino to play him in a sympathetic biopic, but the real Kevorkian can only be described as Doctor Death. A pathologist by training, Kevorkian was obsessed with death. As early as 1959, Kevorkian was proposing experiments on condemned prisoners. He said the ultimate goal of his suicide advocacy was human vivisection: performing experiments on live people. Kevorkian's work was as sick as his goals. He would take pictures of the eyes of dying patients, hoping to capture the precise moment of their death. He would transplant the blood of corpses into himself. He created artwork of a highly disturbing nature depicting death, giving you a view into his twisted mind. Patient autonomy was not Kevorkian's crusade; his was death itself. Kevorkian's killings set off a flurry of seemingly unreal activity. How was Michigan going to deal with it? Were our laws sufficient? Should they be changed? Should Kevorkian be embraced? For 9 years the Michigan Legislature, courts, and local law enforcement were embroiled in a struggle. Much like today's new cycle, it seemed every day brought a new revelation, political maneuver, or Kevorkian killing. At one point Kevorkian held a press conference offering a dead man's kidneys, first come, first served. The conflict eventually came to a head. In 1997 the U.S. Supreme Court ruled unanimously in Vacco v. Quill that there was no Constitutional right to assisted suicide. The Michigan Legislature began efforts to clarify Michigan's law and permanently ban assisted suicide. 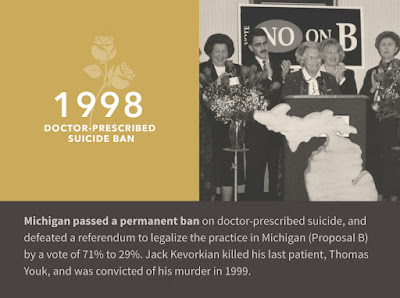 Kevorkian supporters formed a group called Merian's Friends and began collecting signatures to put a referendum on the 1998 ballot to legalize doctor-prescribed suicide in Michigan. Kevorkian's lawyer, Geoffrey Fieger, began making plans to announce a run for governor against Michigan's prolife governor John Engler. Merian's Friends quickly found that unlike Right to Life of Michigan, there was not a lot of grassroots advocacy for doctor-prescribed suicide. They quickly had to give up efforts to gather petition signatures with volunteers and relied on paid signature gatherers. Eventually they gained enough signatures. Though there were numerous fraudulent signatures gathered, the Michigan Board of Canvassers allowed the ballot proposal to go forward, titling it Proposal B. 1998 would be the stage for this epic clash. Media darling Jack Kevorkian vs. Citizens for Compassionate Care (CCC), a coalition including Right to Life of Michigan to oppose legalizing doctor-prescribed suicide. Kevorkian's lawyer vs. Michigan's governor. Everyone was all-in and the people of Michigan would make a decisive decision in November. The polls at first looked troubling for prolife advocates. The misguided compassion of Michigan voters appeared to give Merian's Friends' Proposal B the upper hand. That's when prolifers went to work educating the public about what doctor-prescribed suicide would really mean for Michigan. The campaign was a combined effort marrying high-impact advertising with local grassroots engagement. The day after the November election, the Detroit Free Press' top story read, "Engler crushes Fieger; suicide law trounced." Governor John Engler had easily defeated Kevorkian's lawyer with 62 percent of the vote. The campaign against Proposal B was absolutely stunning. In the summer it looked like Proposal B might cruise to victory. After only seven weeks of educating the public, Michigan voters rejected Proposal B by a vote of 71 percent to 29 percent. The effect of the defeat was so stunning that euthanasia advocates were silent for nearly 20 years in Michigan. Jack Kevorkian's morbid fantasies were dashed on the rocks of the Michigan people. Just a few weeks after the election CBS's 60 Minutes aired a disturbing tape of Kevorkian euthanizing Thomas Youk by lethal injection. A Michigan jury would eventually find Kevorkian guilty of second-degree murder and forever end the career of Dr. Death. 1998 showed the power of the prolife message and grassroots advocacy paid off once again. Though doctor-prescribed suicide cloaks itself in the language of compassion and patient's autonomy, the troubling questions it creates are impossible to ignore. It causes our compassion for the sick and disabled to decline. It erodes patient autonomy as cost concerns become more important that caring for patients' needs. It sacrifices the already low trust the public has in our medical systems. Right to Life of Michigan will continue to educate people about these dangers of embracing suicide instead of patients. The prolife movement will face many challenges in the future, but we'll continue to be a shining beacon for the value of every human life, and persevere through whatever obstacles come our way. Many who began this struggle are no longer with us here today, but your efforts today honor the ideals for which they sacrificed to achieve throughout these last 50 years. Thank you for remembering them throughout this series! Following the release of undercover videos from David Daleiden and the Center for Medical Progress, Planned Parenthood went into public relations overdrive to put a lid on the revelation that they profit by selling the organs of aborted babies. In the last few days several news stories have undone Planned Parenthood's narrative that these "heavily edited" videos are entirely untrue. On December 7, the Daily Beast broke the news that the Department of Justice is in the process of investigating Planned Parenthood for their fetal organ harvesting schemes. Congress held numerous hearings about the matter and the DOJ has asked them to turn over documents for their investigation. On December 9, news broke that two California companies are being forced to shut down for their role in fetal organ harvesting. DaVinci Biosciences and DV Biologics were successfully investigated in Orange County, and the terms of their settlement with the district attorney include a $7.7 million fine and admitting to breaking state and federal organ harvesting prohibitions. Daleiden's undercover videos are the only reason these companies were caught, and it was the Center for Medical Progress itself that filed the complaints. Unfortunately for those two companies, they don't hold the political or media sway of Planned Parenthood. On December 11, it was announced that the FBI is investigating the University of New Mexico and an infamous abortion clinic in Albuquerque for fetal organ harvesting. That's two successful prosecutions and two open federal investigations based on these so-called "heavily edited" videos. Planned Parenthood's spin was a sham from the beginning. Daleiden's videos were not heavily edited and the full footage and transcripts were released for each step in their investigation. They are publicly accessible to anyone honestly interested in the truth. Planned Parenthood had a shady political organization called Fusion GPS review the videos. Fusion GPS is currently mired in a Beltway scandal of epic proportions. Though their review found nothing significant, Planned Parenthood used it to promote their "heavily edited" trope, relying on journalists and their own supporters to never actually read the report itself. Several states also began investigations, though none have been successful yet, for various reasons. Planned Parenthood used these investigations to claim they have been "cleared." In Michigan, for example, Planned Parenthood had ceased harvesting eyeballs in the state in the past. There's nothing to clear. In California, where the bulk of Planned Parenthood's fetal organ harvesting took place, most public officials including their current and former attorneys general are de facto staff members of Planned Parenthood. Right now they are occupied with forcing prolife pregnancy centers to advertise free tax-funded abortions and targeting the Little Sisters of the Poor again. How does any honest person expect them to sincerely investigate potential violations? In Texas, the prosecutors investigating their case took it upon themselves to manipulate a grand jury into a legally-baseless attack on David Daleiden on behalf of Planned Parenthood. The case was thrown out, but not before Planned Parenthood used it to frame Daleiden as a crook in the news media. Planned Parenthood's public relations strategy is never to confront an issue head-on, but to deceive even their own supporters into peddling lies or half-truths. They count on a friendly media to never call them on it, even when knowing lies are caught on camera for everyone to see. The Achilles heel of these investigations will be the personnel responsible for it. As this case has demonstrated—and numerous cases over time—pro-choice public officials can never be trusted to hold the abortion industry accountable. We hope those investigating Planned Parenthood will keep an open mind as they view the evidence for themselves. Even more undercover footage from Daleiden is currently being blocked by a pro-abortion judge. We hope those videos will soon be released. After all, the public is forced to fund Planned Parenthood with their tax dollars: they have the right to know the truth. On Thursday, December 7, Michigan abortionist Michael Roth received a $798 fine and 18 months of probation for three felony convictions in Macomb County Circuit Court. The convictions stem from his suspected practice of illegal at-home abortions. Notable journalist Kirsten Powers made a claim on CNN that abortion rates decline faster under Democratic presidents than under Republican presidents. She said it's Democratic public policy initiatives, not prolife laws, that save lives. Is that true? Powers' claim relies on an article by Neha Thirani Bagri published on the news website Quartz, using the Centers for Disease Control abortion rate figures since 1980. If you look at the graph, it looks like abortion rates did decline dramatically during the Clinton Administration. The numbers are from the CDC, so one might assume they are totally legitimate. Not so fast! Anyone who’s done significant research into abortion statistics knows that the CDC abortion report does not include California, the most populous state in the union. In fact, California stopped reporting abortions in 1998, smack dab in the middle of the time frame Bagri uses to claim Bill Clinton and Barack Obama are better than Ronald Reagan, George Bush, and George W. Bush at reducing abortion. This error means the numbers Powers was using during the Clinton years to back up her claim are worthless. California accounted for nearly a quarter of the abortions in America in 1997, and had an abortion rate nearly twice the national average, 38 per 1000 women of reproductive age versus 20 overall. The massive drop you see in 1998 in the graph is not proof of some great advance by Bill Clinton in preventing abortions; the drop is because the massive state with the highest abortion rate in the union refused to continue reporting their abortion numbers in 1998. It would be like a pollster suddenly taking Democrats out of his polling sample and claiming the Republican is now ahead. It’s tempting to entirely blame Powers for making a claim that’s relying on bad data, but we shouldn't be too harsh. Powers is not some pro-abortion journalist with an axe to grind; she was the one who broke the Kermit Gosnell story into the national news, taking biased reporters to task for ignoring it. After all, the Bagri article she relied on uses numbers from the the CDC, looking credible at a glance. Powers' mistake came from assuming her fellow reporter actually read the reports she was analyzing. True blame for this CNN "fake news" error should rest with Bagri, who either glanced at the report without reading the whole thing, or completely failed to understand it. This is a never-ending problem with reporting in America, especially dealing with abortion. Reporters decry the existence of "fake news," but frequently make or repeat claims without doing even basic research themselves. They often operate no differently than random people on social media, when they are supposed to be trusted to dig deeply into issues. Bagri in particular went on to make sweeping claims in her article about why abortions declined under Democratic presidents. How can she make those bold claims if she didn't even read the abortion report she was analyzing? She also conveniently began her analysis in 1980, completely neglecting the fast rise in abortions under the ambivalent Richard Nixon and Jimmy Carter administrations. Looking at a graph of abortion numbers (both the CDC numbers and numbers from the Guttmacher Institute), someone just eyeballing it should easily conclude that it was Ronald Reagan who changed the trajectory of increasing abortions in America, not that Democratic presidents are solely responsible for decreasing abortions. How many thousands of people have taken Bagri's claims to heart and will repeat them in the future, including influential people like Powers? How many saw Powers make her claim on CNN? How many will see this correction? Telephone is a fun game. In also teaches people a valuable lesson: in every step in a stream of communication vital information can be lost. That’s why it’s always important to go back to the source as much as possible. The next time you hear a bold claim—especially about the issue of abortion—do some digging before automatically running with it. Hopefully next time Powers and everyone reading this will think twice before trusting a writer with a clear bias, even when the writer is using data from a credible organization like the CDC. The next time someone wants to make a claim that only Democratic presidents are responsible for reducing abortion, they need to reconstruct the data set to account for California keeping us in the dark. But even that exercise is ludicrously simplistic. Michigan's experience is a perfect example. The biggest drop in our state’s abortion rate happened in 1989, when Michigan had a Democratic governor, Jim Blanchard. Was Blanchard’s enlightened leadership the cause of this amazing drop? No! In fact, it was his intransigence that prevented even earlier abortion reductions, resulting in the deaths of tens of thousands of individuals who would be with us today. Was that because he was a Democrat? No, it was because he was pro-abortion. There’s also a lot of other factors involved in the ongoing decline of abortion, especially the increase in prolife sentiment in America since the partial-birth abortion debate in the mid-1990s. In a sense we can thank Bill Clinton and his repeated defenses of that barbaric abortion procedure for initiating a sea change in opinion and renewed prolife vigor in the states. Another huge problem with these sorts of analyses is that abortion statistics are not always reliable. In Michigan in the past we know abortion clinics have refused to report their numbers to the state. Even our own official numbers over time are somewhat suspect. We do the best we can when analyzing these numbers, but that importantly includes reading these abortion reports from cover to cover. Any reporter who wants to be taken seriously on these issues needs to at least read the report before purporting to analyze it. Presidents do matter when it comes to abortion, especially for who sits on the U.S. Supreme Court. Prolife laws and prolife education are far more important to saving lives, however. Michigan is proof positive of that. People who recognize that abortions are wrong and want to reduce abortions should join our efforts. We're almost 40 percent of the way to our goal of reaching $50,000 in online matching donations by the end of 2017. Because of the match, your tax-deductible gift will be doubled! Donations to the Right to Life of Michigan Educational Fund support our many projects and programs, including this blog. Without your generous support we can't accomplish important objectives like educating and equipping people to speak about prolife issues. The prolife movement doesn't rely on the world's richest individuals, and we don't have the luxury of a news media that will prioritize covering us. We rely on you, dear reader, to allow us to be a voice for the voiceless. We need $1,250 in daily online donations to reach our goal before the end of 2017. Will you please consider giving $44, one dollar for every year abortion has been legal in America? Your support keeps us posting! For years Right to Life of Michigan has made information available about the connection between abortion and vaccines. This issue finds itself in the news at times, most recently it made a splash in the national news when a mother in Metro Detroit discovered the disturbing link herself. She had to go to court with her ex-husband after refusing to immunize her child with vaccines using aborted fetal tissue. With the pro-vaccine/anti-vaccine debate running rampant these days, the message of educating yourself on the simple facts regarding vaccines can get lost in translation. The minute you raise any concern about a vaccine, you are hit on both sides of the spectrum with opposing arguments. Often people won't take the time to read past a headline; they are stuck between a busy schedule, a blitzkrieg-style news cycle, and the feeling that they've seen and heard all of the arguments before. That's not a recipe for understanding. One simple fact people need to be aware of is the reality that aborted fetal tissue is used to create cell lines for medical research. We believe such research is unethical for two important reasons. First, medical subjects need to give proper consent before research is performed. The unborn aren't allowed to give consent; they aren't even allowed the dignity of being recognized as human. Second, the use of aborted babies in medical research and development creates a perverse incentive to encourage more taking of human life. Using the bodies of broken babies is completely unnecessary. This past October the FDA approved a new form of the shingles vaccine that was created without using aborted fetal tissue. This new vaccine, Shingrix, is already seen as more effective than the abortion-tainted alternative Zostavax. Shingrix is being recommended as the new standard to replace the old. The new vaccine was created using cells lines from hamsters. Zostavax was created using the lung of a 14-week healthy baby boy killed by an elective abortion. Shingrix is a positive development because there was no ethically-sourced alternative to the shingles vaccine. Several vaccines produced using tissue from aborted babies also have ethical alternatives, but several do not. Right now there are no approved alternatives for Adenovirus, Chickenpox, Hepatitis A, Measles, Mumps, or Rubella in the United States. Talk to your doctor and see what sort of alternatives you have available. It is important to ask them questions and find out the name of the vaccine you are requesting. Use the simple cheat sheet we created. The information comes directly from the vaccines' package inserts. Our resource will help you know which vaccines used cell lines from aborted babies and find available alternatives. Please keep in mind many doctors may never have heard this information before. You may have to patiently walk even prolife doctors through this information and encourage them to read the package inserts of the vaccines they use. The choice about using these vaccines is up to you. We must all agree, however, that there is no need to take human lives to make new medical advances. With continued education we can hope pharmaceutical companies focus on producing only ethical alternatives.